So many shapes, so little time. You may have grown up with basic spaghetti, but now there are dozens of pasta shapes to master. Photo courtesy of AarinFreePhoto.com. Pasta comes in hundreds of choices: from the finest strands of angel hair to the widest ribbons of lasagna; to scores of different shapes, both widely used and specialties from every region of Italy; from plain semolina and egg pastas to many flavors (tomato, spinach, and squid ink are just a few). Pasta can be bought either dry, fresh or frozen. Because the smaller, specialty shapes (known in the trade as ”short pasta” or “short goods”) are made by commercial extrusion through shaped dies, they are generally available only as dried products. It is the longer pastas or “long goods”—spaghetti, fettuccini, lasagna, et al—that are available fresh or fresh frozen. Although there is culinary romance in fresh pasta and some people believe that fresh tastes better, others find that there is essentially no discernable taste difference between a quality dry product and a quality fresh product. In fact, there will be a slight difference in taste between commercial and homemade pastas due to the flour. Because it requires industrial strength kneading machinery, home chefs cannot use semolina the basis of manufactured American and Italian pastas. They must default to 00 (double zero) or all-purpose flour, which doesn't have durum’s nutty flavor and firm consistency. This guide to the most popular pasta shapes that follows is courtesy of the National Pasta Association, www.ILovePasta.org. A guide to matching the different shapes with the right sauces follows the chart. Alphabets - This favorite kids’ shape is usually used in soups for a fun meal anytime. Elbow Macaroni [mack-a-ROW-nee] (“Dumpling”) - A highly versatile shape that can be topped with any sauce, baked, or put in soups, salads and stir-fry dishes. Rotini [row-TEE-nee] (“Spirals” or “Twists”) - Rotini’s twisted shape holds bits of meat, vegetables and cheese, so it works well with any sauce, or you can use it to create fun salads, baked casseroles, or stir-fry meals. 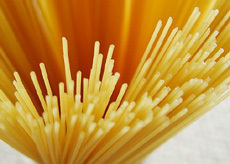 Angel Hair, Capellini [CAP-a-lee-nee] “Fine Hairs”) - Thin, delicate strands are best if used with thinner, delicate sauces. Other uses: break in half and put in soup; use in salads or stir-fry meals. Manicotti [man-a-COT-tee] (“Small Muffs”) - Stuff Manicotti with a mixture of meat, cheese and vegetables, top with your favorite sauce, and bake. Or stuff and freeze for a later time. Jumbo Shells, Conchiglie [Kon-KEEL-yeh]- Best when stuffed with your favorite mixtures of cheese, meat and vegetables. For fusion cuisine, stuff with meat flavored with taco seasoning and top with salsa. Bow Ties, Farfalle [far-fah-LAY] (“Butterflies”) - Bow Ties brighten any meal with their interesting shape. Thick enough for any sauce, or make into a salad or soup. Medium Egg Noodles (From “Nudel,” German meaning paste with egg) - This size of Egg Noodle can be baked, tossed in soups or salads, or topped with cream, tomato, cheese or meat sauces for a delicious meal. Medium Shells, Conchiglie [Kon-KEEL-yeh] (“Shells”) - Shells make a great addition to soups or as the base of a wonderful salad. Try remaking your favorite Macaroni and Cheese using Shells, for a fun twist on a time-honored tradition. Ditalini [dit-a-LEE-nee] (“Little Thimbles”) - This versatile shape can be used as the base of any dish. Bake it, stir it into soups, or create great salads and stir-fry dishes. Wide Egg Noodles (From “Nudel,” German meaning paste with egg) - Go beyond the traditional Stroganoff and use, Wide Egg Noodles to create soups, salads and casseroles. Or, top with any sauce and serve hot. Spaghetti [spa-GET-tee] (“A Length of Cord”) - America’s favorite shape, Spaghetti is the perfect choice for nearly any sauce, or it can be used to make casseroles or stir-fry dishes. Go beyond tomato sauce and see what your favorite becomes. Fettuccini [fet-a-CHEE-nee] (“Small Ribbons”) - Perfect for heavier sauces, like cheese, meat and tomato sauces. For variety, try breaking in half and putting in soups, or use for a salad. Orzo (“Barley”) - This small, grain shaped pasta can be topped with any sauce, added to soups, or baked as a casserole. Perfect as a side dish as well as a main course. Vermicelli [ver-ma-CHEL-ee] (“Little Worms”) - Slightly thinner than Spaghetti, Vermicelli is good topped with any sauce, or as a salad or stir-fry ingredient. Fusilli [foo-SILL-ee] (“Twisted Spaghetti”) - This long, spiraled shape can be topped with any sauce, broken in half and added to soups, or turned into a beautiful salad. Fusilli also bakes well in casseroles. Penne, Mostaccioli [mos-ta-CHOL-ee] (“Quills” and “Small Mustaches,” respectively) - This tubular pasta goes well with sauce, used in salads, baked in casseroles, or made into stir fry dishes. Wagon Wheels, Ruote [roo-O-tay] (“Wheels”) - Wagon Wheels make interesting salads, casseroles and stir-fry dishes. Add to soups, or simply top with sauce and enjoy. Lasagne [la-ZAHN-ya] (From “lasanum,” Latin for pot) - Create new Lasagne casseroles by using chopped vegetables, cheeses and any kind of sauce. You can also assemble your casserole and freeze it for later. Radiatore [rad-ee-a-TOR-ay] (“Radiators”) - This ruffled, ridged shape adds elegant interest to any sauce. It also works well baked in casseroles, or used in salads and soups. Ziti [zee-tee] (“Bridegrooms”) - A medium-sized, tubular pasta shape, Ziti is perfect for chunky sauces and meat dishes. It also makes wonderful salads, baked dishes and stir-fry meals. Linguini [lin-GWI-nee] (“Little Tongues”) - A great shape for all sauces. Also a good choice for salads and stir-fry dishes. Rigatoni [rig-a-TONE-ee] (“Large Grooved”) - Rigatoni's ridges and holes are perfect with any sauce, from cream or cheese to the chunkiest meat sauces. It’s aesthetically pleasing and entertaining to diners to see different-shaped pasta instead of the same old, same old. Changing the pasta shape can make a dramatic difference in a recipe and give it an exciting new look. While many pasta shapes are interchangeable, you can maximize the success of a dish when choosing a pasta shape and sauce that complement each other. The various shapes of pasta are not only artistic, but were also designed to best serve the needs of the sauce. Soup Pastas like alphabets, ditali, orzo, and pastini, are mainly used in broth or soups with a light base, or with light sauces. Strand Pastas, which are thin and delicate—like angel hair, capellini, spaghetti and vermicelli are meant to be served with delicate, fairly liquid sauces: light tomato sauces, light oil-based sauces, light cream-based sauces, and butter-based sauces. Narrow Ribbon Pastas—linguini, tagliatelle, taglierini and trenette—are sauced the same way as strand pastas. They are essentially the same width, but flat instead of round. Wide Ribbon Pastas, like pappardelle and lasagne, are right for meat sauces, thick tomato sauces and thick cream sauces. Tubular Pastas like cannelloni, elbow macaroni, penne, rigatoni, and ziti work well with thick tomato sauces, meat sauces, chunky vegetable sauces, and thick cream sauces—the holes in the tubes and the grooves on the tubes are designed to catch thicker sauces. Thicker Tubular Pastas like ditalini, manicotti, penne, rigatoni and ziti are ideal for baked dishes because they have more body and can withstand being partially cooked, then baked (and re-heated). Stuffed Pastas like agnolotti, ravioli, and tortellinicall for light tomato or cream-based sauces or broth. Shaped Pastas like conchiglie (shells), farfalle (bow ties), orecchiette (ears), radiatore, ruote (wagon wheels), and trenne and twisted shapes like fusilli, gemelli and rotini are also excellent sauce-catchers and work well with heavier sauces. Asian Noodles—Asian wheat and rice noodles, Chinese egg noodles, cellophane noodles (mung bean threads), cornstarch noodles, seaweed noodles, and soba (buckwheat) noodles—generally are not eaten with a sauce. They are used in stir-fries, soups, and salads. 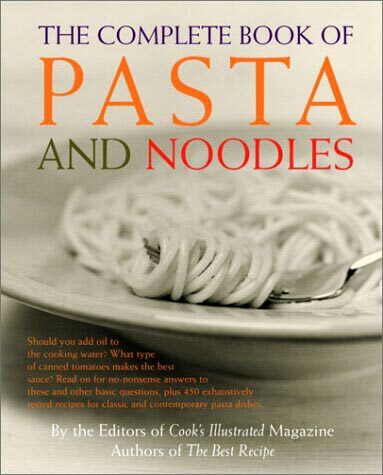 The Complete Book of Pasta and Noodles: A comprehensive introduction to the world's pasta, from everyday to obscure. Click here for more information. 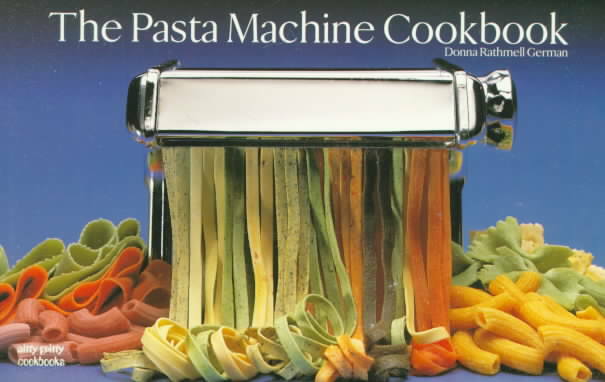 The Pasta Machine Cookbook: 112 varieties of pasta that wow, and you can make at home. Click here for more information. 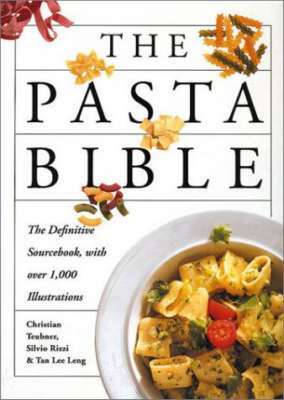 The Pasta Bible: For the adventurous cook that wants to make it all from scratch. Click here for more information. Simac Pasta Machine: From macaroni to linguine, make your own pasta in minutes. Click here for more information. 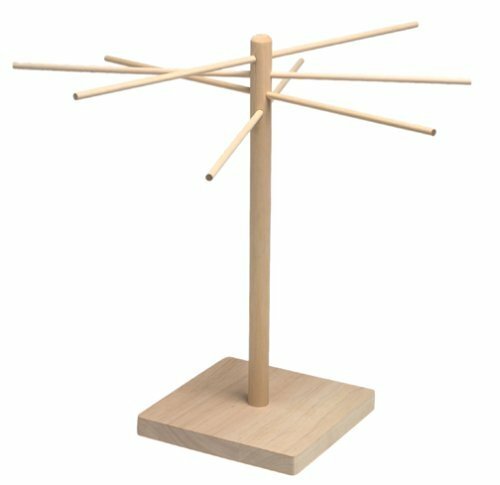 Wooden Pasta Rack: Display and dry your prized pasta for all to envy. Click here for more information. Pasta Roller: Crank out your flat noodle creations the old fashioned way. Click here for more information.